Frontier Basement Systems is a basement waterproofing, foundation repair, insulation, energy evaluation, and crawl space repair contractor serving Central Tennessee (including the greater Nashville area, Clarksville, Jackson, Franklin, and Murfreesboro) and Southwestern Kentucky (including Bowling Green, Paducah, and Hopkinsville). We are greater Central Tennessee and Southwestern Kentucky's only authorized Basement Systems dealer. We are also a Dr. Energy Saver dealer to help our customers with inspections. 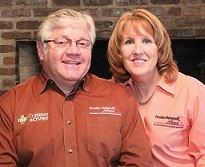 Layne and Judy Gebers are the owners of Frontier Basement Systems which is located in Joelton, TN. They have been in business since 2002 together and love the Joelton area and community. From new construction and remodeling projects to large commercial contracts, Layne and Judy make a great team - as they have been working together (and married) for over 30 years! Most recently they've added radon services to the services they offer area residents. They're constantly involved and looking to help area homeowners. See Us on Ultra Sound Home Inspection's Video! Frontier Basement Systems has helped hundreds of homeowners all throughout Middle Tennessee, Southwestern Kentucky, Greater Nashville by designing and installing effective solutions for keeping basements dry and fixing dirt crawl spaces. In 2005, Frontier Basement Systems, added both radon mitigation and foundation repair services to their list of home improvement services by teaming up with Supportworks to bring the most advanced foundation repair products and services to our customers. Whether your looking to finish your basement or waterproof your crawl space for extra storage space, owners Layne and Judy Gebers and their experienced staff of basement and foundation specialists, can help tackle any problem you may be experiencing! Frontier Basement Systems trains their employees at the corporate headquarters in Connecticut and many employees have earned the esteemed title "CERTIFIED Waterproofing Professional." Frontier Basement Systems is also an esteemed member of the Better Business Bureau, Homebuilders Association, and BNI Group. We have been performing basement waterproofing and crawl space repair in Tennessee and Kentucky since 2002 as the region’s exclusive Basement Systems dealer. "From the beginning and after the completion of the job,..."
"Crew did a great job"
Frontier Basement Systems is a family owned and operated basement waterproofing, crawl space repair, foundation repair, drainage, and basement wall crack repair company. We provide innovative solutions for your home and structural problems... and we care! From small to large projects, we are committed to our customers, our employees and our community. As a small and local company, we know that the only way for us to grow is by one happy customer at a time. We want you to be our next happy customer.